SIM Presidency – it is a SIM member representative, elected by the General Assembly. The President´s mandate shall be a two-year term, counting from January 1st of the year immediately after the election, and may be renewed for a maximum of two consecutive terms. – To administer the Inter-American Metrology System (SIM), and to conduct ex officio all collective acts and decisions aimed at implementing the goals and resolutions of the GeneralAssembly. – To legally represent SIM. – To represent SIM before national, regional and international fora. The representation of SIM shall be exercised by the President or by other Members holding special mandates with prior authorization from the General Assembly or the Council, as it may be appropriate. – To chair the Council and GA meetings. – To be in contact with the Standing Committees, Working Groups, Secretariat and other national and international organizations. 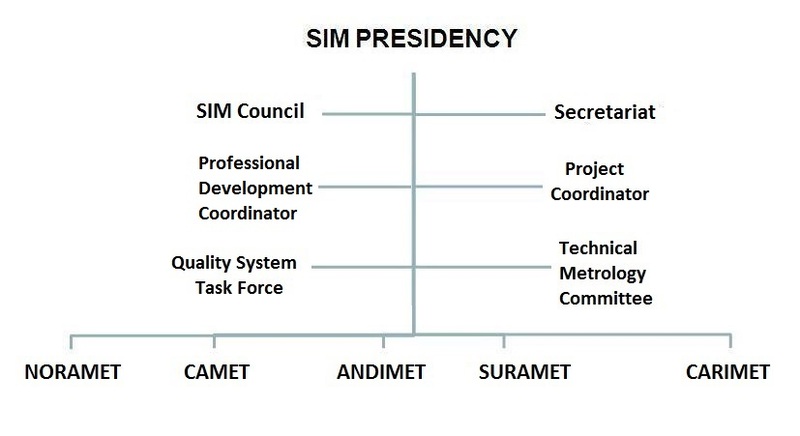 The SIM Steering Council – composed of the President in office, the former President, the Technical Committee (TC) Chair, the Quality System Task Force (QSTF) Chair, the Professional Development Coordinator (PDC), the Project Coordinator and the Sub-regional Coordinators (Noramet, Camet, Andimet, Suramet and Carimet). The Council operates according to the corresponding Rules of Order. The Professional Development Coordinator (PDC) is nominated by the SIM Members and appointed by the Council to promote activities to improve the technical capacity of the Members and Associates in the region. The Project Coordinator is nominated by the SIM Members and appointed by the Council to coordinate managers of projects supporting SIM Activities. The Quality System Task Force (QSTF) is composed of the Chair of the QSTF and representatives nominated by each SIM Member or economy that is a signatory to the CIPM MRA which will have voting rights. QSTF is responsible for reviewing and approving the Quality Management Systems of SIM Members and Associates as required.